A technology student has developed an automatic traffic control system for a level crossing on the theme parks miniature railway system. A pressure sensor detects when a pedestrian passes over it. The sensor is connected to INPUT 1 of a control system. A light sensor detects the presence of a miniature train close to the crossing. The light sensor is connected to INPUT 2 of the control system. When a pedestrian is detected the control system checks if a miniature train has passed the light sensor. 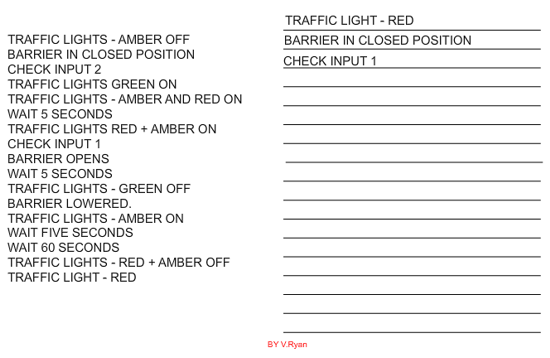 Then the traffic lights run through a sequence of changes, eventually changing the lights from red to green, raising the barrier and allowing the car to cross the railway line safely. 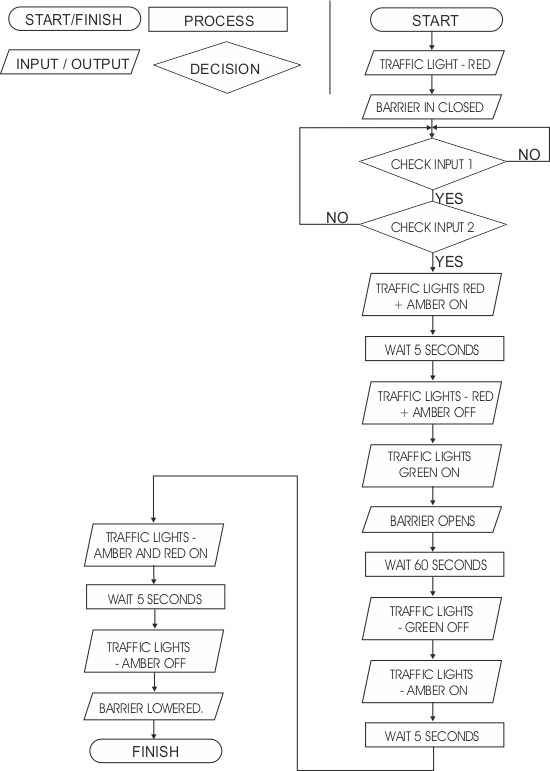 If a train is present the traffic light s stay on red and the barrier stays lowered / closed. 1. The sequence of events are listed below. However. they are in the wrong order. Write the correct sequence of events in the available space. The first three stages have been completed. 2. Convert your sequence into a flow chart using the boxes also shown below. The first four stages have been completed for you.